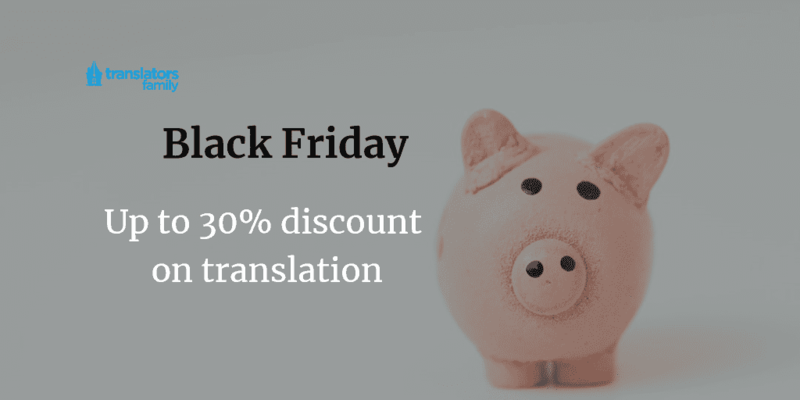 Sworn translation, business, marketing or technical translation, website localisation, interpreting, and other services are available at a discounted price only on Black Friday. The amount of discount depends on the volume of the project, the type of text and urgency. The maximum rate is applied to the projects of up to 10 pages with the standard terms of realization. Our standard price list is available at Translators Family rates page. See our prices for the sworn translation at Sworn translation website. Do not miss the chance to get the lowest price for your translation. Call us, email or come to our office in the very centre of Warsaw and ask for the discounted price.